Merry Christmas or Happy Holidays? Celebrate with the best gift of all: LOVE! Merry Christmas or Happy Holidays?? This time of year we often see shouting from different sides of the fence about the holidays. Some are incensed that someone would dare take Christ out of the holiday, some are angry that someone is pushing for only homemade gifts while others are angry that some families like to shop for their Christmas gifts. I find this puzzling and oftentimes very much counter to the season itself. A season that typically promotes feelings of joy & peace. You may not celebrate your holidays the way your neighbor does, and that’s OK! RancherMan & I are strong in our Christian faith and Christmas is a holiday we embrace as such. We love keeping our faith at the forefront of the holiday. But it’s important to remember that not everyone feels nor celebrates the same as us. Some prefer to say ‘Happy Holidays’ instead of Merry Christmas. I feel the way they embrace their holiday is none of my business. Just as the way we embrace our holiday is none of theirs. Each family has the right to celebrate in a way that works best for them. Santa or not. Gifts or not. Decorations or not! But some like to do a 4-gift system: Something they want, something they need, something to wear and something to read. It’s a cute idea and if it works for your family – go for it! Others like to do a 3-gift system in honor of the 3 gifts brought to the Christ child by the Magi. Another cute gift idea and one that reels in the sometimes overabundance children receive this time of year. If it works for your family, great! Some families like to buy & wrap as many gifts as they can cram beneath the tree. They get much joy out of the excitement on their loved ones faces. If that’s your idea of a wonderful Christmas – do it! But here’s the important thing to remember for all of us. 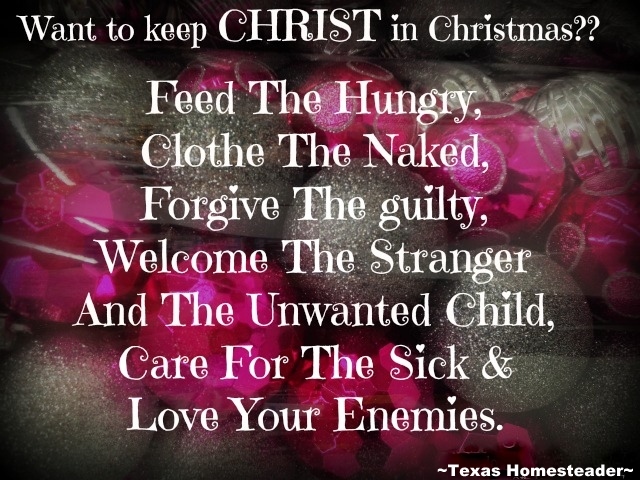 Remember that not everyone is a Christian, not everyone is a minimalist and not everyone will celebrate their holiday as you do. As a Christian I try to stay mindful of the love that Christ taught. So if my initial reaction toward someone else’s values is feeling provoked it’s time for me to look inward & decide if my reactions are living up to my values. Are they helping me to make the holiday beautiful, or are they just dividing lines in the sand? Remember the crazy outrage that exploded on social media last year over the design of a disposable coffee cup? Let’s not do that this year! Remember the outcry in years past over whether someone said ‘Merry Christmas’ or ‘Happy Holidays’? Let’s all remember that we have no right to force our beliefs and values on someone else. If you love Santa and dressing up, do that. Or if you love decorating every inch of your house, do that. And if you relish in shopping for that one special gift for someone you love by all means do that. Enjoy the holidays in a way that speaks to your heart. And maybe – just maybe – we can all share a little love and tolerance this year and allow others to embrace the traditions they love. Wouldn’t that make a beautiful holiday even more beautiful for all of us? What better gift than the gift of love? 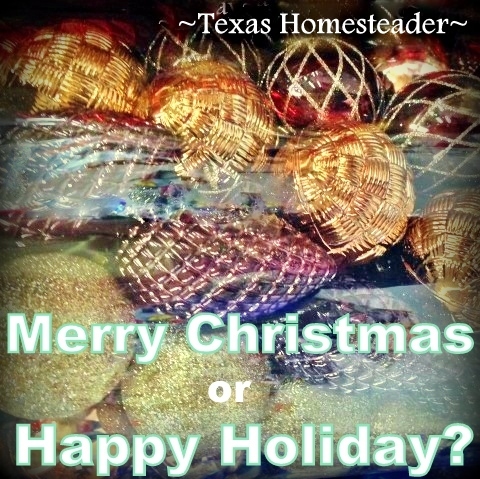 This entry was posted in Blog Posts and tagged Christmas, Holidays, Rants, Winter on November 26, 2017 by Texas Homesteader. Hey Tammy, I have been making Christmas gifts for many years. When my children were young it was homemade bread to go with the homemade jelly I had canned during the summer. Fudge was usually in the gift, too. I made a lot of doll clothes and little quilts for kids. And one year I made mother/daughter matching aprons for the nieces (and sister-in-law). I think homemade is so much more personal. More recently I read a book called, “Year of Plenty”. I talked to the pastor we had at the time about teaching a bible study using it. It was a Presbyterian pastor who wrote it and, I don’t know maybe that’s why she kept making excuses, because she did ask if he was our denomination. The book starts out around Christmas. But if you get a chance, it’s a very good book (if you have time to read a book). And it’s kind of along the lines of your blog. The author is; something Goodwin. Just looked him up his first name is Craig. Hope you can find it, I really enjoyed it. Loved reading your email as it was so heart felt. Thank you for that and may you and yours receive GODs blessings through out the year.